The Radeon RX 480 is a VR-ready graphics card that is designed to be more affordable, while providing similar performance to the NVidia GTX 980. The RX 480 is positioned against the NVidia GTX 1060 which also provides similar performance to the GTX 980. However, the RX 480’s MSRP is $200, while the GTX 1060’s MSRP is $250. Due to demand, the street price for the RX 480 is around $250 or more, while the GTX 1060 is selling for around $300. 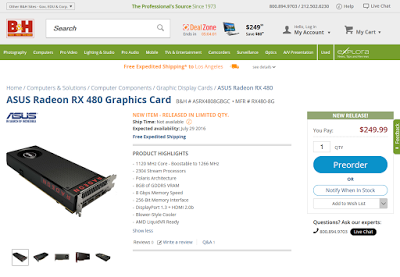 Even at $250, the RX 480 is not easy to find in stock. Meanwhile, the GTX 1060 will be available at B&H on August 6 for $269.99 (you can also preorder now).